It’s January 15. Are you ready to break your New Years resolution? Read on. Back in November, Curt Cutler taught a class on one of his best sellers: Frosted Peanut Butter cookies. The class was packed, and everyone left with little tricks and tips on how to make the perfect chocopeanutbutter treat. You’ve never had one of these delightful goodies? Think of chocolate chip cookie dough, only with peanut butter chips instead of chocolate. Add a thin layer of peanut butter frosting, topped with chocolate butter cream frosting. Oh my. Forget the diet. 10 am and 2 pm (update-both filled as of 1/24). Ten dollars buys you: instruction, recipes, a sample and lunch. Pre-registration required. Hurry classes are filling up fast. Pre-heat oven to 350 degrees and place rack in center of oven. Using a cookie scoop or ice cream scoop, or just a large spoon, scoop into 2 inch balls and place on a parchment lined cookie sheet about 4 inches apart. I bake about 8 cookies per sheet. Bake for about 12 minutes, or until set. After cookies are cooled, frost with peanut butter frosting. Then frost on top of the peanut butter frosting with the chocolate frosting. When spreading the chocolate frosting on top of the peanut butter frosting, be very gentle and leave a small space between the edge of the peanut butter frosting and the chocolate frosting for a layered frosting look (see photos). In the cookie recipe it calls for 3 1/4 cups flour. Are you sure it isn't 2 1/4 cups?? Just making sure. That's right, we use cake flour. If you're using all purpose you would need a bit less. Maybe a 1/4 cup less. That happened to me too. They look like normal chocolate chip cookies would. I’m at high altitude, do I need more flour? Hi Stephanie, you could try using more flour, that may help it rise a little better. Thanks for asking! My favorite cookie by far! I can't believe I now have the recipe … uh oh!!!! Those look delish! Love a good frosted cookie. ps- where is the best place to buy cake flour? Lindsay, Curt will sell a bag to you if you go into his bakery on 500 South, next to the sandwich shop. These are Sarah's favorite cookies! Yummm……..
You've been having classes all winter and I had no idea! AMAZING!!! I made these last night (used AP flour but replaced 2T per cup w/ cornstarch) and brought them to work – empty container by noon! I made these last night and took them into work… everyone was RAVING about them!!! BIG HIT!!! Thank you for sharing!!! My all time favorite cookie at Cutlers is the chocolate/mint one. Do you have a recipe for that one???? Hi Debra, Glad you liked this recipe. It is one of my favorite! I do not have the mint recipe, but will talk to Curt about teaching this one next time around. Thanks for reading! Where are the classes taught? I'm interested. Hi Rachelle, The classes are taught at Cutler's Bakery on 500 South in Bountiful. Check back here for notices, or on A Bountiful Kitchen's Facebook page. How do you find out when the classes are taught? Heidi, I post on this site when classes are being offered. I also post a notice on A Bountiful Kitchen's Facebook page. You're welcome Erica, glad the hubs liked them! Just curious. Why no substitution on the Reese's Peanut Butter chips? Can I use another peanut butter chips? Maybe there's no better PB chips than Reese's? Not that I want to substitute, I just like to know why. Thanks! These are absolutely amazing! Thank you for sharing! I am from Utah and adore Cutler's bakery but never get to go any more. Would you mind if I shared the recipe on my blog? Kelly, Thanks I love this cookie too. 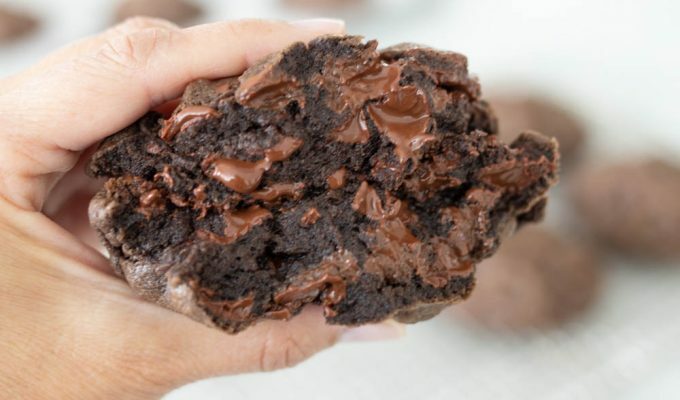 A perfect blend of peanut butter and chocolate in a cookie! Yes, YOu are welcome to share this on your blog. I love your blog! I've made these cookies twice now. They are so easy. I thought they would be much harder. They turned out so yummy and several people have asked me for the recipe. I sent them all to your blog. I would like to post this recipe on my own blog with a link back to your blog if that is alright with you. Thanks for sharing. Can you tell me how many cookies this recipes makes? Thanks for sharing! I used a 2-inch cookie scoop and I got 21 cookies. Where do you sign up for these classes you have mentioned? Hi Kirst, the classes have been offered at Cutlers on 500 South in Bountiful. When class is available, I post it on my Instagram and Facebook page, so be sure to follow there! What a great, easy recipe. Can’t wait to try. Thanks for being a loyal reader! Yes, the peanut butter is in the chip and in the frosting. You will love this cookie! You chocolate frosting looks better than some other versions of this recipe I have seen online. Do you have a recommendation of which brand unsweetened baking cocoa to use? One other question…does Curt use light or brown sugar? THANKS! First, thanks for reading ABK. I so appreciate your support. I am the only blogger Curt has worked with directly to my knowledge. This recipe is directly from Cutler’s, unlike many of the recipes on my blog which are copycat versions. So this is exactly what you get when you visit the store! I am not sure what brand of cocoa Cutler’s uses, but I most often use Callebaut. The flavor is rich and it is moderately priced! Oh, and I believe he does use light brown sugar in this recipe. Thank you Si! I am so glad I found your blog! I made these cookies today and my husband is LOVING them! Mine spread during baking. I’m wondering if I should have refrigerated the dough to keep this from happening. TIA! And thanks again for sharing your cooking expertise! If the cookies are flat, you can add a couple of tablespoons of flour to the dough. Also, refrigerating will help the cookies hold their shape. I always make sure the eggs are cold and I don’t overheat the dough. Hope this helps!